Cheat sheets, in case you don’t know, are pieces of information grouped and well organised in one single sheet to provide you an escape to those memory flaws we sometimes have. In this case, they’re big images with handy and useful information you can use to practise and remember some of the most common pieces of code, shortcuts and more in this web design world. During my navigation I found more than a dozen and can be downloaded for free. You can always contribute to the addition of elements in this collection, just comment down below or send me an email; if you believe there’s a mistake or a broken link, feel free to notify me so I can correct it. Click on the image to download or go to the author’s download page. Reblogged this on The Coders Journey. God ref, from a great blog. Hi everyone! I’m looking for a complete list of data-* attributes used in bootstrap. Pease help me with any info that can help me to find it and download. Would be nice to have a pdf format file. Thanks in advance! This is absolutely the best! Oh, my. Yes, that’s a great set of cheat sheets. Thank you. 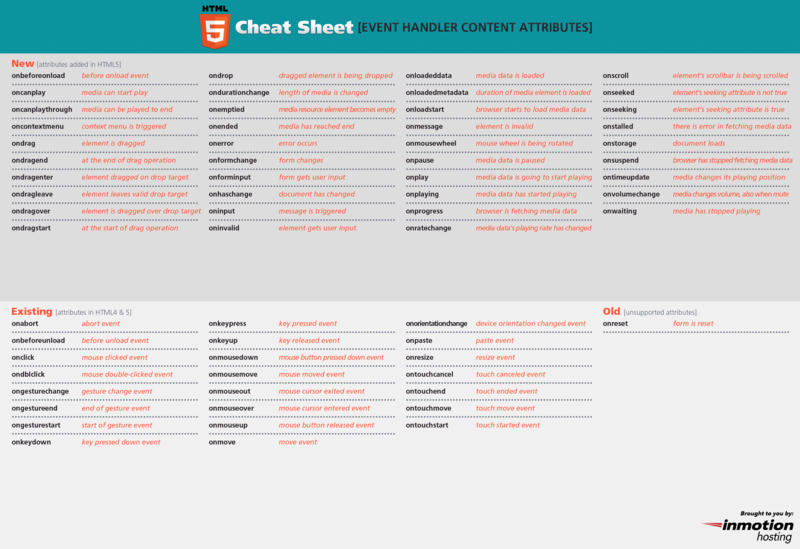 Here’s a great collection of cheat sheets ready to be used by web developers, put together by Creativenauts. This is definitely something I’ll be keeping handy for revision and, well, cheating! This is a great set of Cheat Sheets that everyone should have next to them while coding their websites. Thanks CreativeNauts! Amazing compilation! Some of these will be very handy for my work.